If It's Too Loud...: Drive-By Truckers - "The Perilous Night"
Remember when we all thought American Band was as political and as political as Drive-By Truckers would get? Well, here's a new single, "The Perilous Night." With this song, Patterson Hood gets specific, mentioning Putin and Charlottesville explicitly, and with an accompanying lyric video showing anti-Trump imagery and videos of Russia. Apparently American Band was a warm up. What's even more interesting is the actual song itself. Drive-By Truckers have always been Americana with punk tuned guitars, and that sound is almost completely absent. "The Perilous Night" sounds a lot more like the pop side of mid-90's alternative (think Gin Blossoms and Fountains of Wayne) mixed with soul, complete with an R&B chorus. It's an interesting choice to make their most commercially sounding single for their most abrasive and divisive topic. I can't imagine it wasn't done on purpose. You can watch the lyric video for "The Perilous Night" below. It will be released on December 15 on a 7" along with an absolutely amazing version of "What It Means" that was recorded at the 2017 Newport Folk Festival. You can pre-order a copy here. 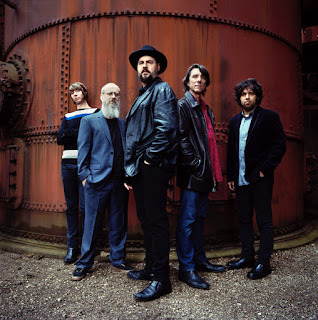 For more on Drive-By Truckers, check out their website.